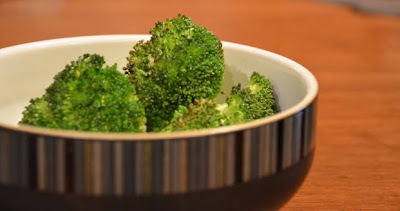 Roasted Broccoli…sounds so drab…or does it? I have been thinking about this broccoli for almost two years. Lest you think I’m joking, I mentioned that I had been working through several America’s Test Kitchen cookbooks before we moved back to Ohio, and this was one of the recipes that got made during that time period. The recipe was copied down and inserted into my huge (read inches upon inches tall) paper stack of recipes, which I finally started to sort through. The enormous number of starred recipes on my Google Reader have kept us more than busy until then. I realize it sounds hilarious, but this broccoli was so good. We couldn’t remember all the details, but I can tell you now that we have the recipe and know how to produce these results again, this WILL be the go-to recipe. A few items that they note are what makes the recipe such a success: preheating the pan, cutting the broccoli into wedges, the very small amount of sugar, and placing the flat sides down. Adjust oven rack to the lowest position, place a foil-lined pan on the rack, and heat the oven to 500 degrees. Cut the broccoli at the juncture of the florets and stalk, and remove the outer peel from the stalk. Cut the stalk into ½-inch-thick pieces. Cut the crown into 4 wedges if 3 to 4 inches in diameter, or 6 wedges if 4 to 5 inches in diameter. Toss the broccoli pieces with the rest of the ingredients in a bowl. Carefully place the broccoli pieces, flat-side down on the preheated baking sheet and roast until the stem pieces are well browned and tender and the florets are lightly browned, 9 to 11 minutes. Serve with lemon wedges.